Bustling, busy, safe, dynamic, fascinating, exciting, energizing- Tokyo is all these things. Asia's biggest metropolis is known the world over for its cutting-edge technology, dramatic architecture, trend-setting fashion and, of course, award winning cuisine! Yet, Japan's capital is not merely a city of crowds, commerce, glass and steel. A visitor soon finds that for every skyscraper there is a shrine or temple, a place of calm and stillness. For every shopping centre a well-tended park where the seasons are marked by the changing blossoms and foliage. Trendy modern restaurants share space with traditional neighborhood operations who have been serving customers for generations. Spring and Autumn are favorite times for locals and tourists as the temperatures are pleasant, the seasonal dishes delicious and seasonal colours stunning. Winters are cold but rarely see snow. Summers are hot and humid but also the season for festivals, fireworks and other entertaining events. Served by the most extensive commuter rail and subway system in the world, a traveler can rest assured - these trains will, with very rare exceptions, be on time, clean and efficient! One visit to Tokyo may not be enough, but any visit will leave memories that will last a lifetime! Sushi and sashimi. Tokyo's world famous Tsukiji Fish Market yields up an incredible variety of top quality seafood every day. It comes as no surprise that some of the city's best sushi and sashimi can be found around the market and in nearby Ginza. 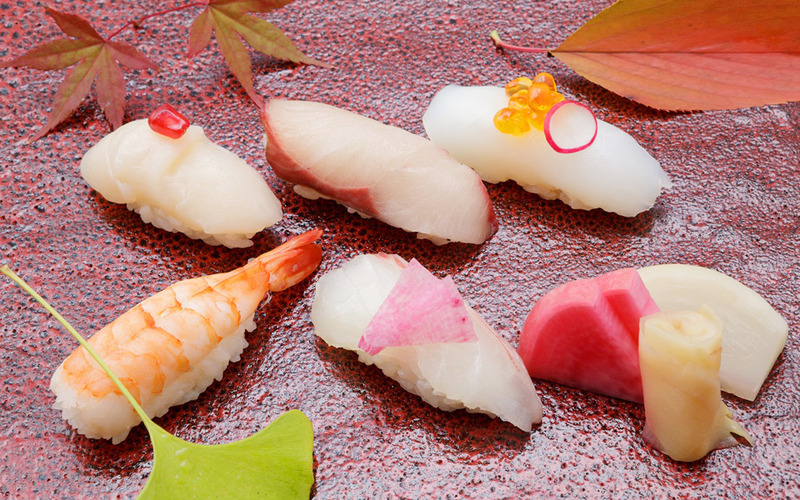 A form of sushi first made here in Tokyo, Edo-mae sushi is now to found all over the world. No matter what the season, a traveler can be assured of freshl seafood almost everywhere they go in Tokyo, from high-end sushi bars to izakaya pub-style restaurants to reasonably priced kaiten sushi shops where high-quality pieces slowly flow by the diner on a conveyer belt. Monjayaki. Tokyo's version of okonomiyaki is different in several significant ways from its cousins in Kansai and Hiroshima. Fresh ingredients such as seasonal vegetables and seafood are finely sliced or chopped and mixed into the batter. The finished dish is not quite as solid as okonmiyaki so monjayaki is eaten off the griddle using special spatulas. A Tokyo original well-worth a try! Tokyo Street Food. 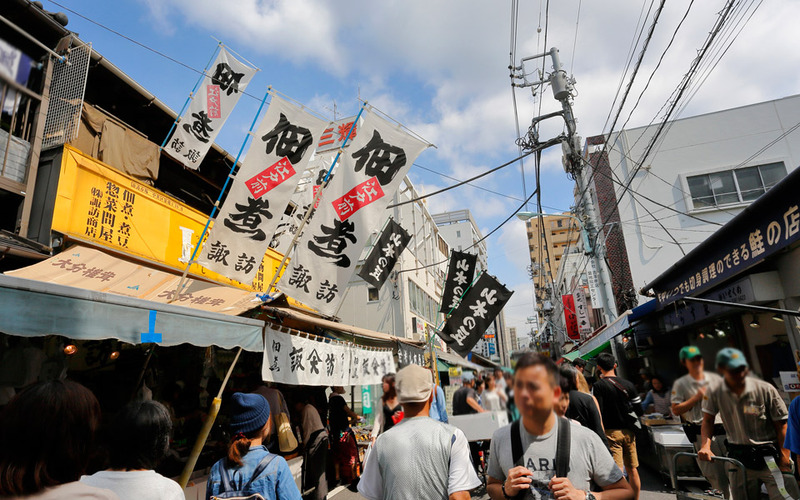 Found under train tracks, near office buildings or at small yatai food stalls pulled by the cook to places around major stations, Tokyo street food offers a chance to try some local favorites while getting to know some of the citizens of this vast city. Defined by reasonable prices, and simple menus, visitors can look forward to skewered chicken & vegetable yakitori, nourishing oden hot pot or ramen noodles amongst many other offerings in a more relaxed atmosphere than the busy streets would suggest. Just follow the usual rule of thumb, a stand or stall with lots of customers is probably busy for good reason! Chuo-ku District. 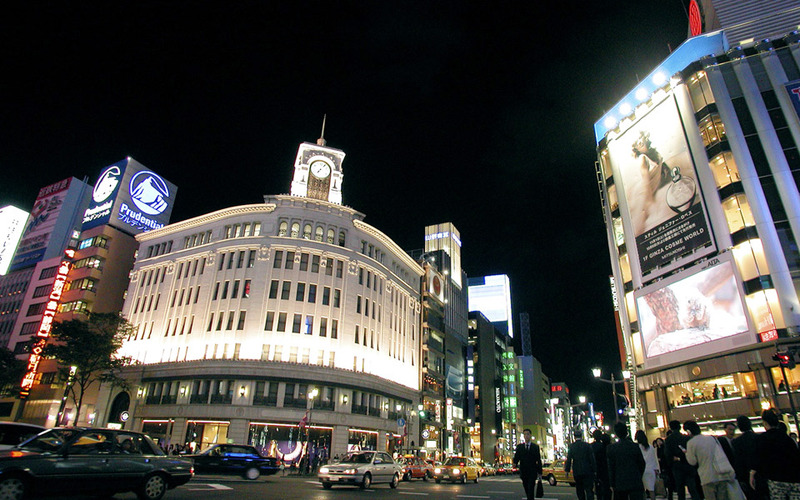 Chuo-ku District contains perhaps the 2 most internationally prominent locales in all of Tokyo: Ginza and Tsukiji. Ginza, named after the goldsmiths that used to populate the area, is today one of the most famous shopping areas in the world. Boutiques from leading fashion houses such as Chanel, Louis Vitton, Gucci are joined by leading Japanese designers as well as department stores who trace their founding back over a century or more. Not merely content to have a plot of land in Ginza, these shops are, more often than not, architectural masterpieces of their own creating a special atmosphere. Yet, one would be mistaken to assume Ginza as merely a brand-name shop area. Specialty shops, long-established restaurants and artisans that have located in the area for over a century help maintain a balance between the modern and the historical Ginza. Enjoy strolls through it's fashionable streets, especially on Sundays when the main street is closed to traffic, creating a huge pedestrian zone. Tsukiji is world famous for one thing, but it does this better than anywhere else. Tsukiji Fish Market has become a tourist destination in its own right as travelers flock to see the jaw-dropping variety of seafood on auction (as well as the prices it's sold for) before settling down for a meal at one of the area's very reasonable and utterly delicious seafood restaurants surrounding the market. Visitors should note that access to the auctions is limited to a specific area but still an experience unlike any other in the city! Kanda Matsuri Festival. One of the 3 most famous festivals in Japan (along with the Gion Matsuri and Tenjin Matsuri), the Kanda Matsuri dates back to the early 17th Century and is held every mid-May. Celebrations are divided into odd and even numbered years with the even numbered festival celebrated on a smaller scale. Odd-numbered years, however, see truly spectacular sites as nearly 100 mikoshi portable shrines are carried by 100s of participants while mounted priests accompany the parade as it winds its way through Tokyo's Chiyoda-ku district towards Kanada Myojin Shrine. Sumidagawa River Fireworks. One of Japan's oldest fireworks festivals-and certainly the biggest, the Sumida-gawa Fireworks date back to at least the mid 17th Century. 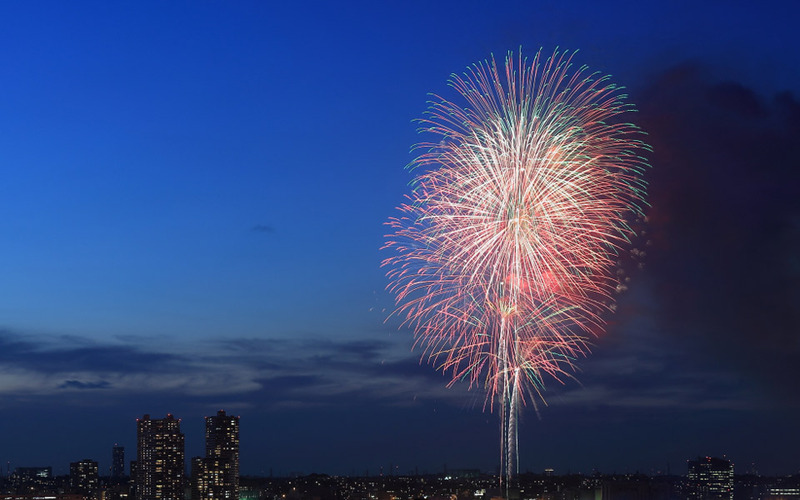 Held at the end of July, 100s of thousands of spectators line the riverside and bay areas to take in the tens of thousands of fireworks launched over Tokyo Bay. Many of the participants wear traditional yukata light kimono, lending a traditional air to the event. Tsukiji Shisi Matsuri Festival. First held to celebrate the completion of a land reclamation project in the 17th century, the Tsukiji Shisi Festival is unique in several ways. The highlight of this June festival is the pair of lion heads carried by 2 teams. The female lion head is carried only by women participants while the male is shouldered by men. The main mikoshi portable shrine is carried by everyone creating a unique scene not often witnessed at festivals in Japan.